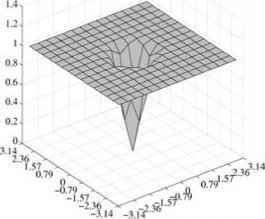 At a conceptual level, there is a great deal of similarity between 1D signal processing and signal processing in higher dimensions. 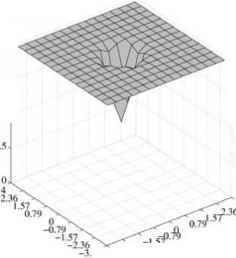 For example, the intuition and knowledge gained from working with the 1D Fourier transform extends fairly straightforwardly to higher dimensions. For overviews of signal processing techniques in 2D see Lim , or Granlund and Knutsson for higher dimensional signal processing . Copyright © 2000 by Academic Press. All rights of reproduction in any form reserved. where 5 denotes the Dirac function, the Fourier transform will be concentrated on a line with orientation normal to the plane, and the function along this line will be constant. 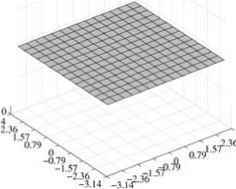 where u denotes the 2D frequency variable, m1 the spatial frequency of the signal. The bottom figures show the transform pair of a signal consisting of the same signal in F1 plus another sinusoidal signal with frequency ffl2. FIGURE 1 (Top) Sinusoidal signal with low spatial frequency. 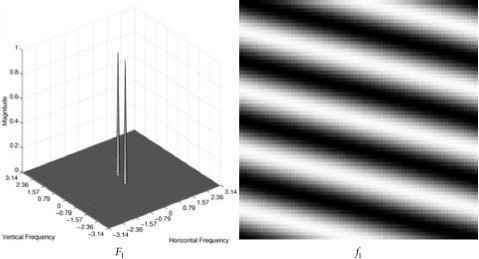 (Bottom) Sum of the top signal and a sinusoidal with a higher spatial frequency. By expanding the expression in the parentheses (af — 6fp) afip + a(f — fp) — 6ftp, we can write Eq. (9) as will reduce the signal component to 10% of its original value. The result of the application of this filter to the signal F1 + F2. (Fig. 1, bottom) is shown in Fig. 2. The lower-frequency component is almost invisible. Filters for practical applications have to be more general than "remove sinusoidal component cos(raTx)." In image enhancement, filters are designed to remove noise that is spread out all over the frequency domain. It is a difficult task to design filters that remove as much noise as possible without removing important parts of the signal. FIGURE 2 Notch filtering of the signal fl + f2, a sum of the sinusoids. The application of the filter h in Eq. (7) reduces the low-frequency component to one-tenth of its original value. be constructed thereof, 1 — Hp (top right). 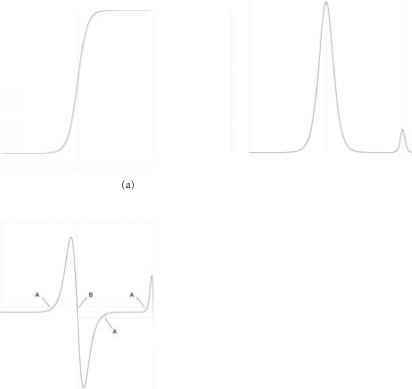 Figure 3 (bottom left) shows the identity filter from adding the two top filters, and (bottom right) a filter where the highpass component has been amplified by a factor of 2. Figure 4 shows a slice of a CT data set through a skull (left), and the result of unsharp masking with y = 2, i.e., a doubling of the highpass part of the image (right). The lowpass filter used (fp in Eq. 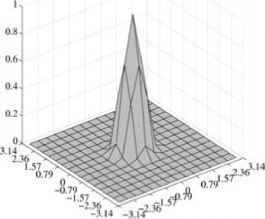 (11)) was a Gaussian filter with a standard deviation of 4, implemented on a 21 x 21 grid. FIGURE 3 Visualization of the filters involved in unsharp masking. See also Plate 1.